202 pages | 4 B/W Illus. 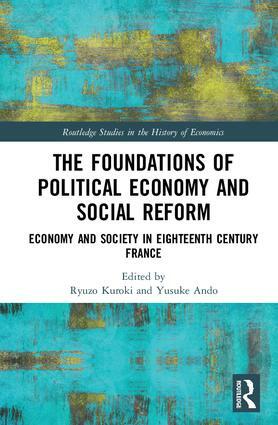 This book brings together leading contributors to explore the development of political economy in eighteenth century France from an interdisciplinary perspective, in particular the ideas for social reform proposed before the Revolution. Political economy in the Eighteenth century encompassed not only what we traditionally regard as economics but also moral philosophy, natural jurisprudence and political theory. This volume explores the different arguments that were made for reforming the economic organisation of the Ancien Régime before the French Revolution. In doing so, the contributors show that political economy in France laid the foundation for social reform ideas throughout the whole of the eighteenth century. Ryuzo Kuroki is Professor in the College of Economics, Rikkyo University, Japan. Yusuke Ando is Associate Professor in the College of Law and Politics, Rikkyo University, Japan.